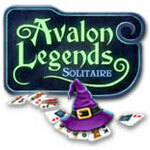 Avalon Legends Solitaire Game - Download and Play Free Version! 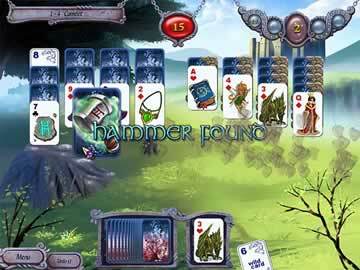 Play Solitaire in a World Ruled by Sword and Sorcery! 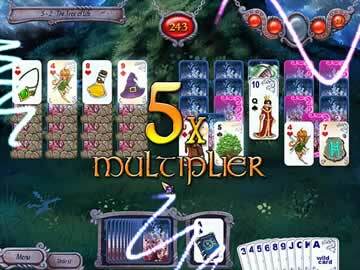 Avalon Legends Solitaire is first and foremost a great solitaire game, and you can play it in standard mode countless times and have it be completely new each time. Each hand, the game lays out 35 cards in a 5x7 pattern and it’s your job to remove all cards from the board. There is an in-play pile with a face-up card, and you can remove a card from the board and onto that pile only when it is one rank higher or lower than the current face-up card. Story mode uses the game described above as its base, but the object of this mode is to work your way through 200 levels, each consisting of 10 hands. The ultimate goal is to rebuild the Deck of Nature and to recover 13 other artifacts. At each level, you’ll have objectives. Conquer those objectives and you’ll earn Deck of Nature cards, wild cards that can be used in jams, and gold for purchasing power-ups from the shop. One thing that Avalon Legends does particularly well is give you a sense of world. The game doesn’t burden you with story, but with just a few well-placed elements, it gives you a real sense of mythology and the feeling that you’ve been thrust into the second act of an ongoing saga. It is this sense of story that makes Avalon Legends become something more than yet another solitaire game. The Avalon Legends Solitaire story mode is exquisitely addictive, and you may just find yourself up past your bedtime trying to squeeze in one more hand. In standard solitaire, hands fade from memory quickly. In Avalon Legends, each hand is an important step on your journey. These steps affect your path and your success, and the great successes and the epic failures will remain with you for some time. Solitaire isn’t for everyone, but even if you’re not a fan of basic solitaire, this game is certainly worth a look. What makes a role playing game it so addictive? For many, it’s the character building. Each experience point is a record of your past and crucial step toward your future. Avalon Legends brings that same allure to the table as you battle your way through a heroic journey to reassemble the Deck of Nature and collect the 13 artifacts.